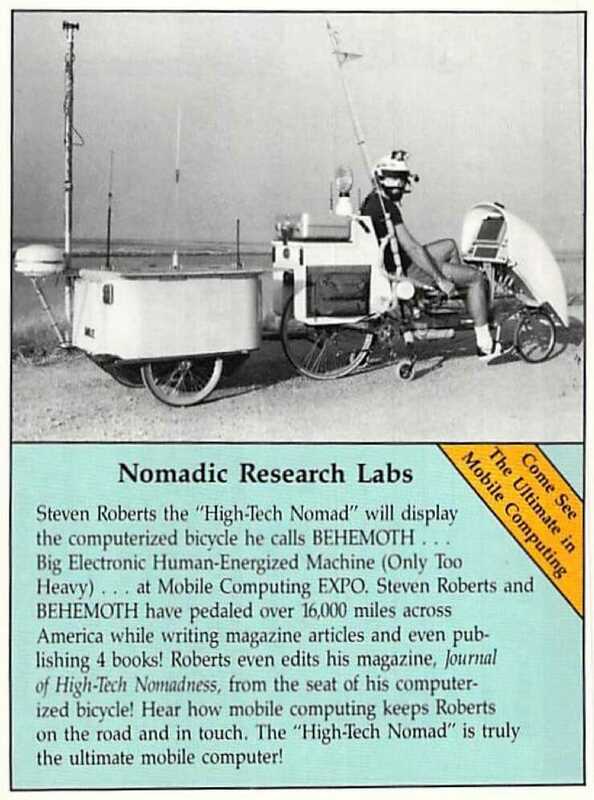 Steven Roberts the “High-Tech Nomad” will display the computerized bicycle he calls BEHEMOTH . . . Big Electronic Human-Energized Machine (Only Too Heavy) … at Mobile Computing EXPO. Steven Roberts and BEHEMOTH have pedaled over 16,000 miles across America while writing magazine articles and even publishing 4 books! Roberts even edits his magazine, Journal of High-Tech Nomadness, from the seat of his computerized bicycle! Hear how mobile computing keeps Roberts on the road and in touch. The “High-Tech Nomad” is truly the ultimate mobile computer!